wasabi2k: My 16GB is on its way using Youshop - expected 28th/29th. 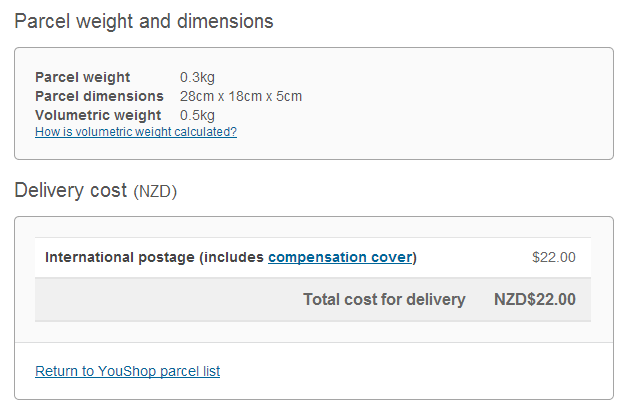 What was the total NZ$ price?? Thanx . Even better than i thought.. I ordered a 16 GB model from Amazon and the YouShop shipping was $22, expected 30th December. Time2303: I ordered a 16 GB model from Amazon and the YouShop shipping was $22, expected 30th December. .... weird - mine was $17. Need a new phone for my wife and she currently has Iphone 3S, but not wanting to fork out 3x the prices of a Moto G to get an Iphone 5 for her. I think the Iphone 3 uses a standard SIM (MiniSIM). Iphone 4 and Moto G uses MicroSIM. I had a MiniSIM in my old Motorola Defy. I went in to a Vodafone shop and they switched the miniSIM for a new SIM that was MiniSIM in size, but had a MicroSIM popout. When my moto G arrived I just popped out the MicroSIM. Doing that is free, and it includes all your contacts and stuff that is stored on your old SIM. If you order a Moto G it would be worthwhile doing the swap early so you are all ready to go when the Moto G arrives. I've had several items via YouShop, pricing seems quite inconsistent. Some of their measurements can be a bit "creative". FWIW Tesco's are listing the 16GB for £129.00 and the 8GB for £99! - Now the catch is that they're locked to Tesco's network, but another £2.04 will get you an unlock code. Ha - mine arrived tonight - just in time for christmas. Unfortunately we are away - so I made use of Youshop's redirection service. I got the custom's cleared email - and had until 6PM that day to redirect. Changed address and name - delivered the next day. Ok, Moto G has been given and was a hit as a first smart phone. It's a decent device, seems quite fast. The camera seems ok. The bezel's quite large, top and bottom especially, but sides as well. Overall it does feel like a budget device (high end budget device) mostly because while build quality is good it's not comparable to more expensive phones. The S4 looks and feels like a much higher end device, but it does cost around 3x more. It will do my fiance for a good while though I think, and if she wants something better it can be a good backup phone for us. Does anyone know how to easily toggle WiFi, 3G, etc on the Moto G? On my S4 I just pull down the top menu, but it doesn't look like that works on this phone. Also is there a built in way to show battery percentage up top, or does it need an app? There is a built in widget for controlling WiFi, bt, GPS etc. Haven't looked at the bat % thing myself. You can either pull down from the top with two fingers to show the toggles panel, or you can pull down the notification panel normally and tap the icon on the right.